Want Long, Thick Hair? 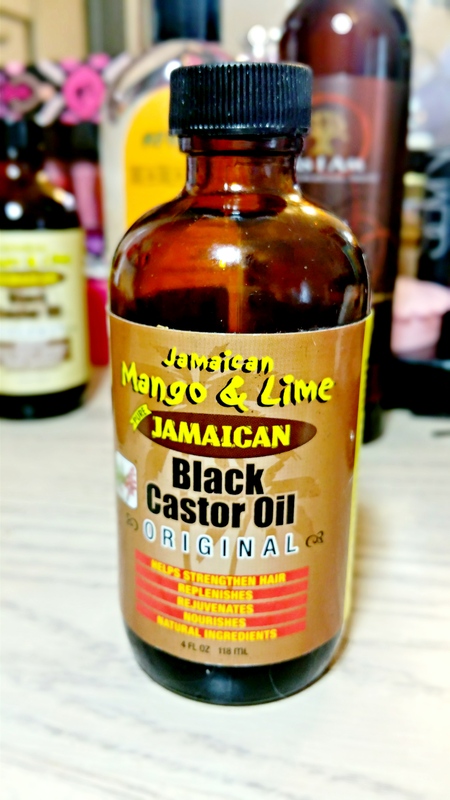 Try Jamaican Black Castor Oil! Can you believe that just adding a little Jamaican Black Castor Oil to your routine can completely transform your hair? You should! For centuries, Jamaican Black Castor Oil has been a hair care staple for many reasons. It’s extremely moisturizing, conditions and strengthens the hair and it increases hair growth. It’s pretty much a miracle oil! I bought the Jamaican Mango & Lime Jamaican Black Castor Oil many months ago and I’ve used it pretty much everyday since. In fact, I’ve already finished this bottle and went back to grab another. My relaxed hair is very thick and very dry so I’m always on the lookout for products that make my life a little easier and this is it. Since I’m always pretty busy and too tired (lazy) to really do anything to my hair I live in a high bun. Which is great for protecting my ends and retaining length but not so much for the edges over time if I’m not careful. However, I apply a little water and a dime sized amount of Jamaican Black Castor Oil to my edges everyday to keep them nice and healthy and prevent them from thinning out. Which brings me to another reason why I love this stuff. Not only does it moisturize, condition and thicken my edges but it lays them down too! I usually stretch my relaxers for about 6 months so I’m usually walking around damn near natural with a ton of thick, curly new growth. Again, I just add a little water and Jamaican Black Castor oil and bam! Instant, sleek shiny hair. And lastly, I’m obsessed with Jamaican Black Castor Oil because it keeps my ends healthy which helps me retain length. Just like I tend to my edges, I like to give my ends a little extra TLC because that’s how you keep your length. Since I’ve started using Jamaican Black Castor Oil regularly my ends have been in great shape. I’ve cut down on trims since I don’t get split ends nearly as much as I used to. Plus, my hair is so much thicker when straightened. My hair is crazy thick when air dried but once I put heat to it it gets very fine. It’s still pretty fine in texture but my hair has way more body now and doesn’t look all flat and stringy like it used to. Bottom line, I love this stuff. Love it! I could honestly go on and on about it because the benefits are endless. Regardless of your hair type, if you want long, thick healthy hair this is the oil you need! You can find it at your local Sally Beauty, Walgreen’s, Target, etc for under $10. ← Urban Decay Friends & Fanatics Flash Sale! Hey Fancie, this sounds EXCELLENT and the price is hard to beat! I’ve never tried castor oil, but I actually used to put olive oil on my hair for a while before I shampooed it off. I’m guessing this works in a similar way (although hopefully smells better than olive oil ha)! I finally chopped quite a bit of my length off a few weeks ago and now I am not too fussed about my hair, although I probably should pay a little more attention! Glad you found something that works and is cheap! My ends gets coarse and dry, so I rub in some Shea Moisture Coconut & Hibiscus Curl & Style Milk into damp hair, then seal it in with Agave Oil. I also like the SexyHair Soy Renewal creme Oil, has coconut & argan oil. You always have some great Shea Moisture suggestions lol. I just added the souffle to my list and now I’m gonna toss the style milk on there. I’ve been addicted to SM lately!